It seems as though I haven't done one of Tyler Lee's outfit of the day post for ages now so I thought it was time I put one up. His outfit today is so adorable! As you may have seen from his other outfit posts I dress him in a mixture of real baby clothes to little person clothes and today we're back to baby blue. This outfit was one of his christening gifts and I think it is so handsome on him. The trousers are white and baby blue stripes and the top is long sleeved with the striped arms and animal motifs and buttons on the chest. As Tyler Lee is almost four months old now, teething and weaning he dribbles a lot so it's essential for him to wear a bib otherwise the neck of his top get soaked in saliva which I imagine can be very uncomfortable for him. I teamed the outfit with plain white socks to compliment the white of the stripes. 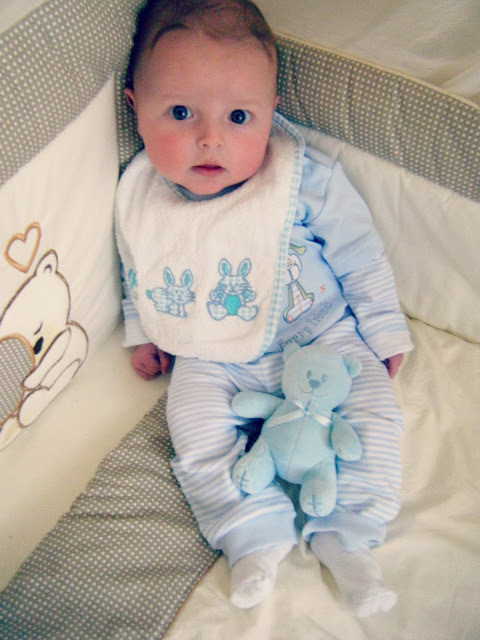 I also gave him his little blue bear which was one of his birth gifts, it's so cute! I love him in baby blue but find as he gets older and the sizes get bigger the beautiful baby outfits become more cartoon based, which I'm personally not a fan of and everything seems to be based around jeans. 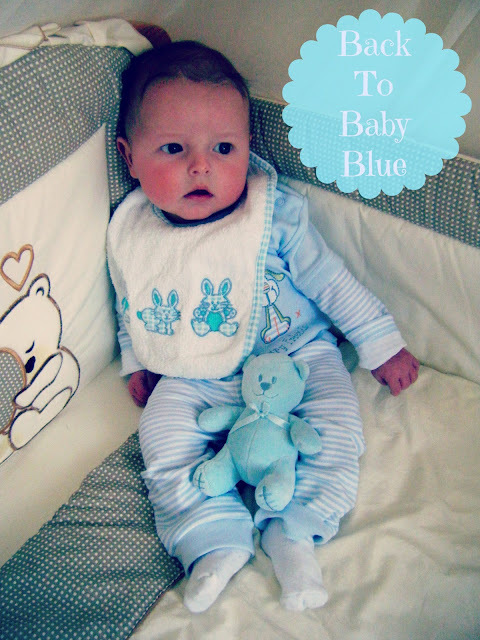 It's a shame because I don't want to let go of my little baby just yet and the baby blue suits him so well! Top and trouser combo - Dunnes Stores. Teddy bear - Emile et Rose. What a beautiful baby! I have 5 kids and my youngest just turned 1 this week!! I am glad to be out of "baby" stage BUT miss it at the same time! i would love for you to swing by and share at my bloghop today at http://www.frugalfitfamily.com ! Aww so cute! He does suit baby blue. I've noticed its impossible to buy in bigger sizes too - so sad! Though the boutique brands do still sell it (Emile Et Rose, Tutto Picollo, etc) - expensive but I'll pay it to keep Tyne in baby blue a bit longer lol. Your baby is sooo adorable!! !